Swimmers prepare to enter the lake during the 2015 Great Lake Plunge, which was held at South Beach. This year's race was held at Greenwood Street Beach. 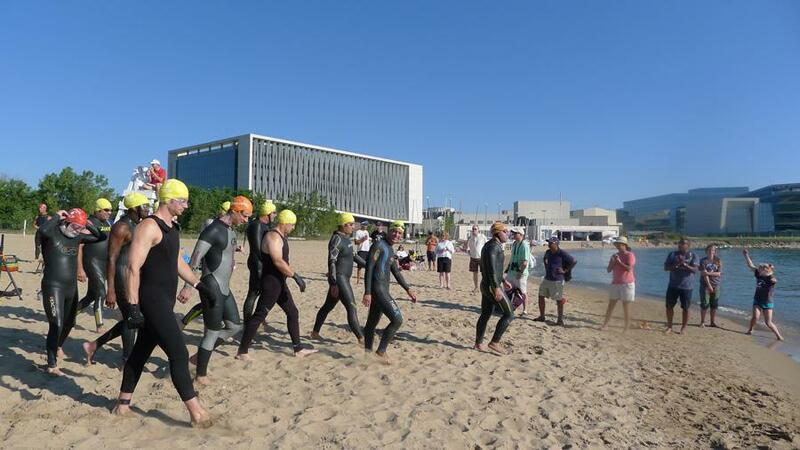 Local area swimmers took to Lake Michigan on Sunday morning for the third annual edition of the Great Lake Plunge, an open water swim of various distances held to raise funds for Evanston Swims!. The plunge, which is Evanston’s only open water swim, had an estimated 180 participants ranging in age from 8 to 70, event organizer Kendra Robinson said. The event, hosted by the non-profit organization OWLs, will donate its proceeds to Evanston Swims!, a program that gives 2nd-graders in the city free swim lessons, she said. To prepare for the event, Robinson said the group worked with the city and other organizations to ensure everything from water safety to portable toilet delivery was taken care of. She said the organizers used a checklist to ensure nothing slipped through the cracks. Due to strong currents, Greenwood Street Beach was closed on Friday and Saturday. While the beach was open for swimming Sunday, the waves still had an impact on the races, forcing organizers to reverse the direction of the race course, Robinson said. Participants were able to choose between four open water events: the 200 meter, 1 kilometer, 2 kilometer and 4 kilometer races. They were also allowed to adjust their choice based on water conditions or a reevaluation of their skill set, Robinson said. Joe Magiera, a volunteer at the event, said that he became involved with the event because he swims with many McGaw YMCA U.S. Masters team members who helped organize it, but does not participate in any of the races. He said he enjoys pool swimming more because of the more controlled conditions. Aaron Carter, who participated in the event for the first time, said he found out about it while training for a triathlon. He said he hoped training for the unpredictable conditions of open water swimming would help him better handle it in triathlons. Reflecting on his race, he thought it was “a wreck” but recommended the experience to potential participants. “If you swim, you should come out and try it,” Carter said.